The Shell Group of companies is the largest on the FTSE 100 by market capitalization to report on gender pay in the UK as required by the UK Equality Act 2010 (Gender Pay Gap Information) Regulations 2017. The Shell Group of Companies in the UK (Shell UK) can report a mean gender pay gap of 18.6% in 2018, as required under the UK Equality Act 2010 (Gender Pay Gap Information) Regulations 2017. This compares to the mean gender pay gap of 22.2% reported in 2017. The change can be attributed partly to measures Shell UK has put in place to close the gap. It is also a reflection of 12 months of global business activity with employees moving to and from the UK; and restructurings, mergers and divestments all impacting our figures. The gap arises because of demographics within Shell UK and the wider energy industry. We recognise that traditionally a greater proportion of men than women have studied for, and pursued, careers in the energy and engineering sectors, and this trend continues today. 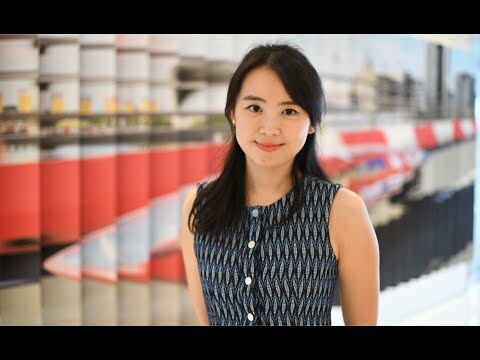 As a result, Shell UK currently employs twice as many men as women and has a greater number of men than women in senior and technical positions. This has resulted in a gender pay gap. Shell UK has been working to address this imbalance and continues to do so. We aim to ensure the equal participation of women and men in all areas of work, at all levels and locations ensuring equal access to the same recognition, reward and career progression opportunities. You can read more about our progress towards gender balance and the Shell UK 2018 gender pay gap report here. You can read our 2017 gender pay gap report here. 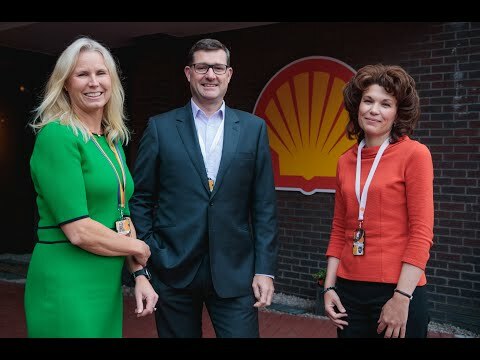 How Shell UK have addressed the gender balance in their leadership team and are now extending efforts to reach balanced representation throughout the business. Rhythmic instrumental music featuring strings and keys. We have a very exciting business here and we need the very best minds to deliver on our very challenging objectives. Slightly panning bird’s eye view of a deep water platform surrounded by ocean. Reverse mid-view footage of a worker, wearing safety gear, walking through the piping and infrastructure of a plant beneath blue sky. Close-ups in profile, cutting to a front view, of a worker, wearing safety gear, her gaze focused on the wheel she is turning. I’m Steve Phimister, Vice President for Shell’s Upstream business in the UK and Ireland. We know that diversity creates the environment that we need for creativity and innovation, which is why we’re doing our best to address our gender balance. Close-up of Steve Phimister, speaking into the camera, seen in an interior office environment. Close-up in profile of a man and a woman seated alongside one another, engaged in conversation. High angle reverse view footage of the same two people, seated at a work station in an office, engaged in discussion; the man points to the computer screen facing them. Point of view footage, entering through a doorway, of several people engaged in discussion in an office, two seated in office chairs next to workstations, another standing and leaning against the work station countertop; a car park and trees are visible through the expanse of windows in the background. The shot cuts to a closer view of the three people engaged in discussion. Over the last 12 months, on my leadership team, we have gone from a 20% female representation to where we are today, which is in balance. We’ve done that by casting the net very widely for the best minds and the best talent we can find across the Shell group. Close-up of Steve Phimister, speaking into the camera, seen in an interior office environment. Mid-view footage of several people seated around tables in a meeting room, laptops and documents open on the tables in front of them. Close-up of one of the women, Marianne Eide, seated at one of the tables, and then cutting to a close-up of her colleague seated across from her, as they speak in turn. Footage from various mid-view and close-up angles of two young women engaged in discussion, standing in front of a white paper chart on the wall to which different coloured post-it notes are affixed along with text and graphics; both touch and point to the chart in turn as they speak. Close-up of Steve Phimister, speaking into the camera, seen in an interior office environment. I’m Marianne Eide. I’m the UK Development Manager. I think this really matters. Having women at the top of the organization as their role models will really encourage others to pursue their careers. This hasn’t just helped our gender balance, but it’s brought a different cultural perspective, and what we’re seeing is that it does make a difference. Close-up of Marianne Eide, speaking into the camera, seen in an interior office environment. Low angle footage of a worker, wearing safety gear, descending a stairway in a plant, the sun shining brightly in the blue sky above. Mid-view footage of two women, cutting to each one in turn, as they are engaged in discussion while seated in an office environment. Slightly panning footage of a man seated at a desk, wearing a headset, his gaze focused on the laptop in front of him; garden foliage can be seen through the expanse of windows behind him. Profile footage of several men and women seated at desks alongside each other in an office environment, an expanse of windows forming the background. Mid-view, cutting to close-up footage of a man and woman standing at a tall, round table in a modern professional interior space, holding coffees and engaged in discussion. Close-up of Marianne Eide, speaking into the camera, seen in an interior office environment. I’m Anthea Hampson, Offshore Operated Asset Manager for the UK. By having better balance in the teams and greater diversity, we achieve better business outcomes. And as a UK leader, I’m proud of the progress we’re making on this. Close-up of Anthea Hampson, speaking into the camera, seen in an interior office environment. High angle close-up footage of a couple of the men seated in a meeting room, one gesturing as he speaks. Profile footage of a man and two women seated at desks alongside each other in an office environment, an expanse of windows forming the background. Wide footage of Anthea and another women seated in a meeting room, engaged in discussion, more colleagues seated together in the background. Close-up of Anthea as she speaks to her female colleague, cutting to a close-up of her colleague seated across from her, listening as Anthea speaks. Close-up of Anthea Hampson, speaking into the camera, seen in an interior office environment. And the work doesn’t stop there. We’re now extending our efforts to try to reach balanced representation much deeper into our organization throughout the business. Close-up of Steve Phimister, speaking into the camera, seen in an interior office environment. Low angle, slightly zooming wide shot of Steve, Marianne and Anthea posing alongside one another, a large Shell pecten displayed on the brick wall that forms the background to the shot. Shell Pecten centred on a white background with text displaying below, then dissolving to white. Nigel Hobson, Claudia Schlipf and Sophie Tao speak briefly about the Shell Trader Development Programme. Side-angled view of two women looking at computer screens in an office location. One of them is wearing a headset. Side-angled view of several men at their work stations. We’re working hard to improve the gender balance in our trading organisation. We need the best men and women to succeed in a very competitive sector. Reverse-angled view of a woman looking at a computer screen displaying various graphs. Wide-angled view of the trade floor. Shot of a woman at her desk laughing. Reverse-angled view of a man looking at several computer screens displaying various charts. Shot of two female colleagues talking. Close-up of a computer screen displaying a graph with different coloured lines. Close-up of a computer screen displaying a quote list and currencies. Close-up of Nigel Hobson speaking to off-screen interviewer set against an out-of-focus background of the trade floor. But achieving gender balance can be challenging because people have an image of what they think the trading industry is like, and it can put off some candidates. That’s something we’re determined to change. Wide-angled view of the trade floor. Shot of three men standing up as they prepare to leave a meeting room. Close-up of a woman. Shot of a man standing up looking at a series of computer screens. Side-angled view of a woman looking at a computer screen. One way to get a better balance tomorrow is building strong foundations today. That’s why we’re focused on our trader development programme. Side-angled view of a woman. Close-up of a computer screen displaying different colored lines as a series of green horizontal lines and percentages are superimposed. Wide-angled shot of Claudia Schlipf talking to a male colleague as they walk towards the camera. Wide-angled shot of Claudia Schlipf and the male colleague walking on the trade floor. Close-up of Claudia speaking to off-screen interviewer set against an out-of-focus background of the trade floor. The trader development programme is an intensive two to three-year course that gives people the skills they need to become a successful trader. Shot of two men talking at their work station on the trade floor. Shot of a man and woman looking at a computer screen. Wide-angled view of the trade floor, panning down slightly to focus on a series of computer screens displaying different sets of data. Back to close-up of Claudia speaking to off-screen interviewer. But we were really struggling to attract diverse applicants. So, by changing the way we promote the programme and refreshing the candidate selection process, we’ve noticed some fantastic results. Last year, 45% of our intake were female, which is way up on previous years. Shot of several men and women on the trade floor at their work stations and discussing amongst themselves. Reverse-angled view of a woman at her work station. Close-up of a man and woman talking. Close-up of a woman smiling. Wide-angled view of the trade floor as a Sophie Tao approaches. Close-up of Sophie Tao speaking to off-screen interviewer set against an out-of-focus background. The trader development programme is a fantastic introduction to trading. There’s a really good mix of people on the programme, different genders, backgrounds and nationalities. Close-up of a group of individuals sat looking out in front of them past the camera as one of them talks. Wider-angled shot of the same group now showing several female colleagues as they discuss. Close-up of two women, as one of them talks. Back to close-up of Sophie Tao speaking to off-screen interviewer. It gives us all the skills, experience we need, and access to a great network of mentors to support us in our careers. Close-up of a man talking and gesticulating, followed by close-up of a woman listening and nodding. Wider-angled view of the man and woman sitting at a booth. Back to close-up of Nigel Hobson speaking to off-screen interviewer. It’s great to see a more diverse community taking shape, which is already making an impact on our bottom line. This is just one of the many things we are doing to build better gender balance, and all of us on the leadership team are determined to continue making significant progress. Close-up of a hand typing on a keyboard. Shot of a woman smiling as she stands beside a female colleague sat down. Close-up of a woman looking at a computer screen. Shot of a woman standing up, looking at and listening to a male colleague sat down in front of her on the trade floor. Side-angled view of a woman wearing a headset and talking. Shot of a man and woman standing and talking on the trade floor. Close-up of a woman looking out in front of her. Close-up of a series of computer screens displaying sets of data. Close-up of a woman looking out in front of her.